Here’s an old photo taken by official city photographer, F.W. Micklethwaite, in 1893. 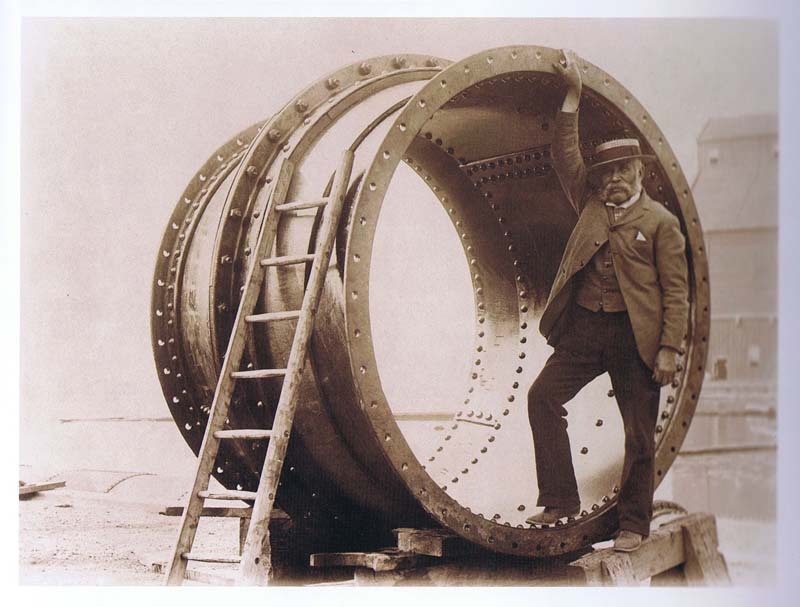 Depicted is a six-foot steel intake pipe joint that was used to supply Toronto with drinking water from Lake Ontario. I have no idea who that sharply dressed fellow is, but he bares a resemblance to legendary British civil engineer, Joseph Bazalgette (who died in 1891). I’ve been a bit busy lately and haven’t had a chance to get underground for a while. However, perhaps I’ll take a slight hiatus from an exclusively underground blog, at least until I get my waders back on. So for now, here’s a view from Sugar Beach on Toronto’s waterfront. 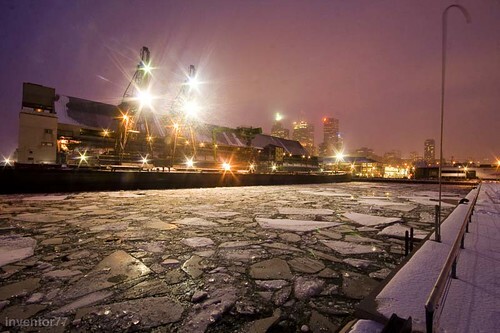 The building across the chunky channel is the Redpath Sugar facility in which the new public place was named after. This is technically the first time I’ve been underground this year as visits to outfalls don’t really count. I’ll also take this opportunity to announce that I’m in the process of putting a book together. It will be released by an Toronto independent publisher this upcoming September. More details will follow eventually once things begin to pick up speed as we are still in the planning stages. I’m currently working on some of the written content for the book, which will give my photos some context and background stories to my explorations. Some pieces from this blog may appear as well. I’ll post an update in the coming months. I don’t have any new content, so here’s the main junction of the east-end’s overflow network. The left archway leads to the Midway combined sewer that stretches to the east end of Greek town along Danforth ave. Sewage is diverted at Gerrard street where the Mid-Toronto Interceptor (completed in the 1970’s) begins to make its way south to the treatment plant. Overflow sewage encounters the older and smaller High-Level Interceptor further downstream. If both interceptors become overwhelmed, the last resort for rogue grey water is to head down the archway pictured above that outfalls into the lake. The right-hand archway takes in overflow from the smaller East-Toronto combined sewer that follows the curve of Kingston road. In addition to its connection with a small storm drain, this overflow conduit has a few overflows from smaller sewage lines before the main diversion chamber. Here is the same junction photographed during an inspection in the late 1940’s or early 1950’s. It’s possible this was taken either during rainfall judging by the water level, but it’s possible the smaller diversions were regularly overwhelmed before more the modern interceptor was built. This drain in North York originally had its outfall at this shaft until the mid-80’s (judging by the date of the graffiti). An arched corrugated metal pipe extended the outfall another 100 feet. I can think of a couple reasons for this. The first is that a new subdivision was planned to occupy the space downstream of the original outfall. The second might have been to place the outfall in a more obscured area . The current position is tucked away in a ravine perpendicular to a major street and is pretty much invisible from the sidewalk. I was passing through the area of the Taylortihuacan overflow and decided to take some shots at its outfall. The park is suspiciously quiet at night and you can’t shake the feeling of being watched by someone in the shadows. During his walking tour in this past year’s Jane’s Walk, author and senior editor of Spacing Magazine, Shawn Micallef discussed his experience walking through the Vale of Avoca/David Balfour Park ravine near Yonge and St. Clair. He recalled going down at night with a friend for a walk in the near pitch black. As they strolled along the trail they noticed several small, pulsing orange lights around them and in the distance. They were the cigarette embers of men standing in the dark just off the paths. The ravine was known to be a gay cruising area at night, which might be misinterpreted as something sinister by someone who didn’t know the hidden connotations of the park. Although Toronto is known to be a progressive and accepting city, prejudice still exists outside the neighbourhoods in which such lifestyles are celebrated. It will likely take another generation or two until acceptance is mainstream. Back to the image above, the flow from the sewer upstream is diverted into the creek’s main trunk sewer that follows the path of the ravine. Manholes pockmark the park and fills the area with the eerie white noise of a ferocious current below. In the event of an overflow, untreated sewage spills into this small box conduit into Taylor Creek. You might recognize this outfall from my post on the film, Toronto Stories. A short ways upstream in the Court of the Earls the 2700mm brick pipe changes its composition for a few hundred feet. The half-brick-half-concrete design is also seen in a portion of the Garrison Creek sewer. Bryan probably has the nicest photo of it here. In other news, Jon Muldoon has more or less retired his blog of underground photography since moving to his new home in a small town in central British Columbia. According to him the largest drain in the city is 400mm so we shouldn’t expect any new drain photos until he takes a trip out to a bigger city. Lacking any new relevant content, here’s a collection of junctions. Above is a dual arch junction from two storm/overflow sewers, East Toronto Combined sewers. Witek (who doesn’t update his site anymore) was in town for a brief visit this weekend and the weather decided to help us out. This spot is a couple kilometres upstream of the outfall in Viceroy. Surprisingly this is the only spot with much graffiti aside from the typical tags seen just inside the outfall grate. It seems unusual for non-drainers to travel this far through a drain and up dangerous inclines, but perhaps there’s some sort of secret society we’re all unaware of. Here’s a photo that nicely illustrates what a waste of time this outing was. 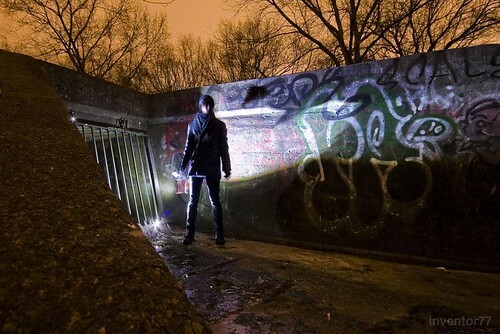 Originally, it was speculated that this overflow conduit lead to some sort of large containment chamber beneath the empty lot that use to hold a treatment plant. Such was not the case. We followed this box tunnel a short distance where we were forced into an ever smaller oval metal pipe. After what seemed like a marathon of not-quite-crawling, we reached the weir to a very small combined sewer. It was most uncomfortable. We also disturbed a bloated raccoon who somehow fit in the horizontal space along the left side of the wall in the above photo. He must have been plumping up for winter. One of the two steep slides through the Earls along a stretch of unique piping. Tall concrete arch with curved brick floors and sturdy steel railings up the slides. In related news, BlogTO has posted a feature that offers short conversations with two gentlemen, who have proven to be an informative and aesthetic resource for anyone who has ever been curious about the world beneath their feet. One of the smaller slides in the Court of the Earls. Just about every structure like this came complete with a handrail along the side. Adjacent sewers branching into this one unfortunately did not. Happy Halloween from your friendly neighbourhood drain zombie. This photo is taken near the last stretch of pipe before this, collectively, expnansive system meets the lake. 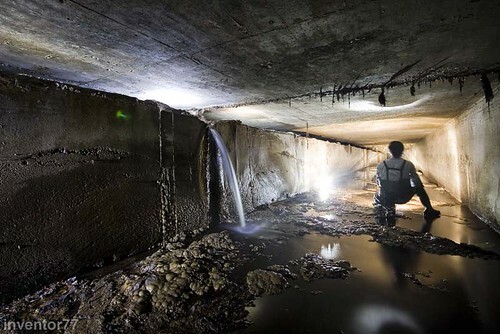 It services overflow content from at least two main sewers in East Toronto. 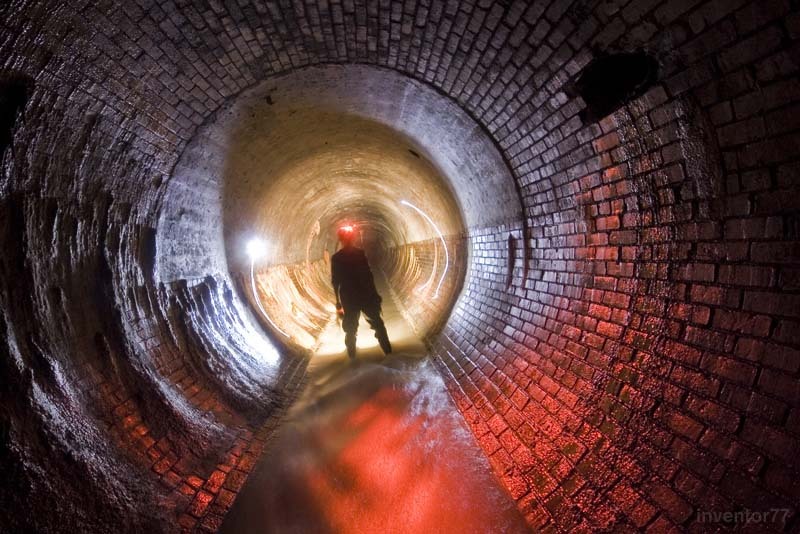 The larger combined sewer is intercepted in a chamber up at Gerrard street from the Mid-Toronto Interceptor by means of a large weir. There’s smaller interception further downstream to the High-Level Interceptor. During normal weather the overflow conduits should remain relatively clean with only storm water maintaining the flow. More on this system next time. Seen here is an overflow conduit that functions as a last resort for a large collector sewer in the suburbs of Hamilton, Ontario. 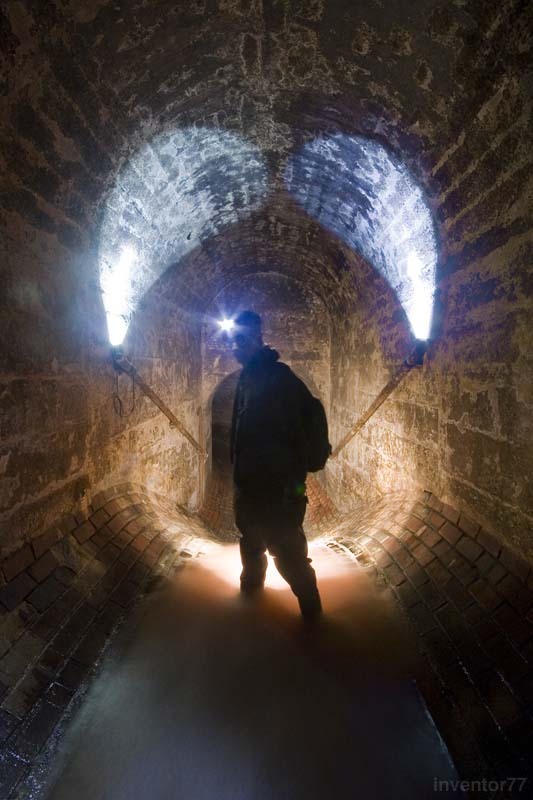 Originally this section provided primary relief in the case of a swelling sewer. Nowadays it’s only used when the adjacent storage tanks are overwhelmed. Judging by the similar design to Stairway to Paradise in the opposite end of town, this staircase pipe was likely built in the 40’s or 50’s. 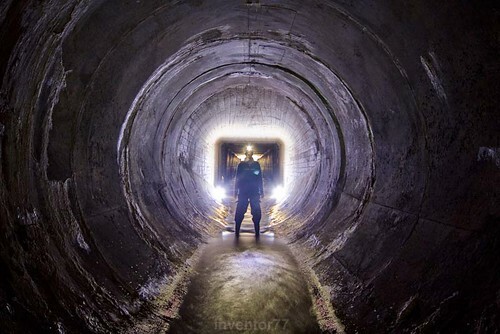 If you walk to the top of the stairs you’ll be stopped by a large flood gate that can only be opened mechanically somewhere on the surface in a control building. It’s believed that there are a series of gates that eventually travel to the 15-foot weir to the sewer. There are at least two that we know of, as we saw the other side of one through the main overflow staircase that feeds into the storage tanks, seen in the previous post. We’re pretty sure those two staircases are the same pipe, just divided by the gates. When the gates are up, overflow sewage fills up the massive cylindrical storage tanks that are the size of baseball diamonds. The tanks have openings at the top that are like a balcony to look down from. 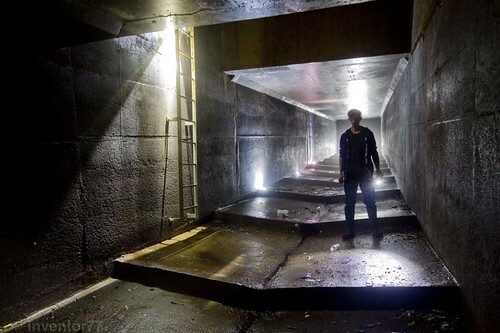 If the enormous tanks were ever to overflow, a newer corrugated pipe has been installed that converges with the staircase, which drains into the ravine. Luckily that may only happen once in a decade due to the sheer capacity.